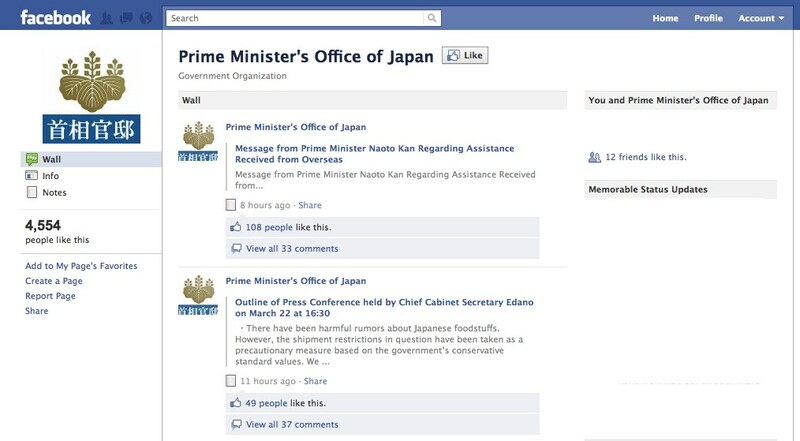 This is the official Facebook page of Prime Minister’s office of Japan. We will provide information focusing on the quake-related issues for the time being. After about 15 hours, the page now has over 4,500 fans. What’s interesting is that the only language being used is English, indicating that the prime minister’s office is targeting a non-Japanese user group here – and not necessarily the 2.6 million Facebook users currently registered in Japan. After the earthquake, on March 16, the office also opened an English Twitter account that now counts over 22,000 followers. You’d think theyd have more urgent matters to see to right now. Some Japanese media are referring hyped news from oversea, which report that Japanese government and TEPCO hide some secrets, and that caused serious public fear because some people think any English media are trustier than Japanese media. Those Japanese organizations suddenly starting using social media might be affected by that.